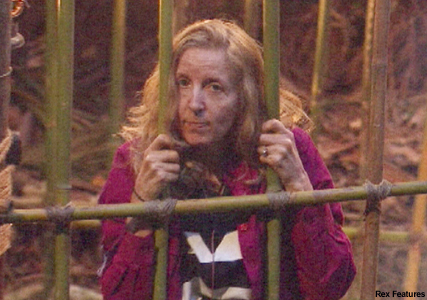 She’s endured eight Bushtucker Trials and 17 days in the jungle, but eccentric TV nutritionist Gillian McKeith has become the latest star to be voted out of the I’m A Celebrity jungle. Gillian told Ant and Dec that she was relieved to be out of the jungle and hit back at claims that her dramatic fainting attacks were ‘fake’. ‘I’m so happy, I’m so happy I cannot tell you! I’m the happiest person alive,’ she said. The sorry star also revealed that she didn’t know why she had gone into the jungle when she suffered from so many phobias. Calling the Bushtucker Trials ‘draining,’ she explained: ‘The first day I thought that would be it and then each day it would start again and the anxiety levels grew into panic attack mode. ‘I felt as thought I was on high alert all the time. Talking about the Dreaded Digger Task, she said, ‘I felt like I had a breakdown in that digger. Finally, Gillian backed X Factor runner up Stacey to win the show. ‘She’s definitely the Queen of the jungle in my book,’ she said.